With my brother and I's birthdays close together at the start of March we always go out for a meal as family. Each year we each get to choose where we'd like to head although on the recovery from my broken leg and with dad struggling with his knees we thought staying local would be a good idea. The parents moved up towards Mapperley last summer and whilst it's been a regular haunt of ours for drinking with the Bread and Bitter, Wetherspoons' Woodthorpe Top and Tree Tops amongst our favourites previously but we'd never really done much food-wise except for the ocassional trip into Wetherspoons so it now offers us a chance to explore a different area and review somewhere different for the Nottingham Food Lovers blog. We all love a good curry as a family so Bombay Brasserie made sense as a local option for food. It's been on Plains Road as long as I can remember and we needed to try somewhere different. On arrival for our 20:30 booking last Saturday night we walked in from the cold and could instantly see the place was buzzing. Very busy which is always a good sign, especially on a Saturday night when a local restaurant should be busy. 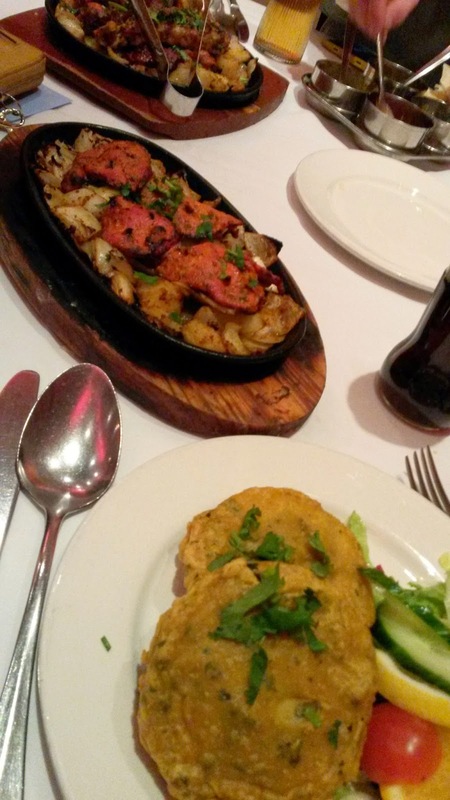 What Food Did We Choose at Bombay Brasserie? Indian starters are always a good warm-up for what's to follow so as well as a generous selection of poppadoms we shared between us a Tandoori platter featuring as selection of chicken tikka, lamb tikka, seekh kebab and chicken kebab along with an onion bhaji. We also ordered portions of chicken tikka and aloo tikki which came out of a very good size, justifying our decision to only share a small number of starters among ourselves. Our main courses were fantastic, although in honesty we overdid it a little by ordering three Nan Breads and four portions of Pilau rice. Having never tried a Jai Puri curry before I was intrigued at how it would be. The menu promised it would be a very hot, classic Indian dish from Rajasthan in Western India with chillies and tomato sauce. 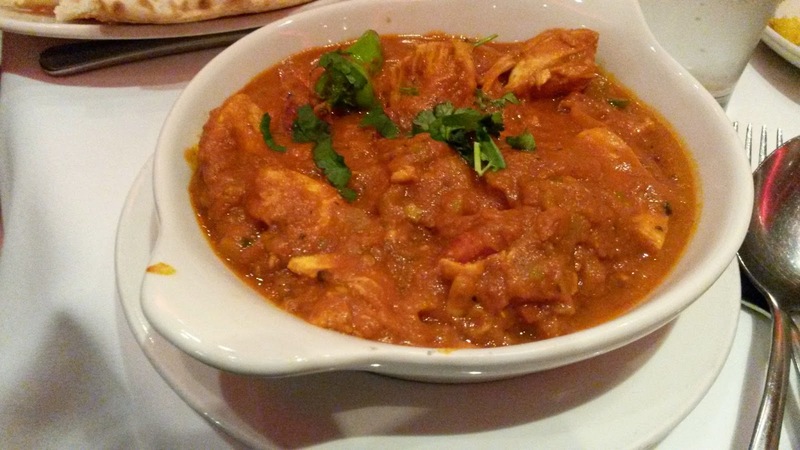 It certainly packed a real punch without blowing your tastebuds away and I'd definitely recommend it to anyone that likes to taste a curry but also enjoys something with real kick. 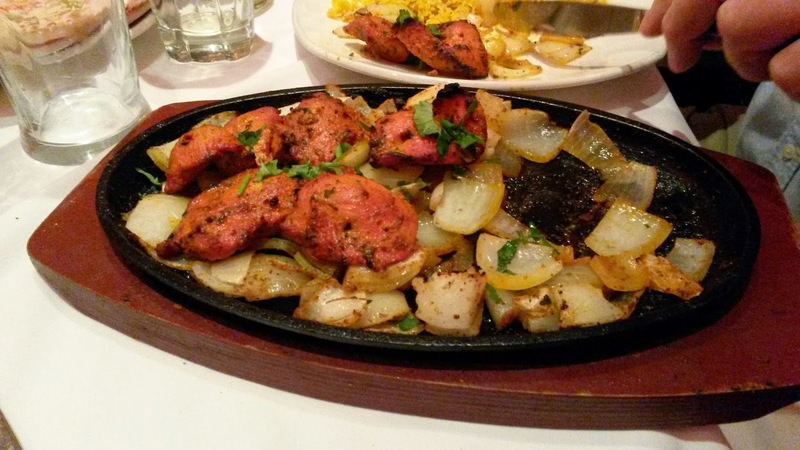 Dad really enjoyed the chicken tikka sizzler which came on a bed of chargrilled onions and mum also really enjoyed her Lamb Biryani which she polished off without what appeared to be any effort whatsoever. The Chicken Tikka Saag and Korma also went down very well. 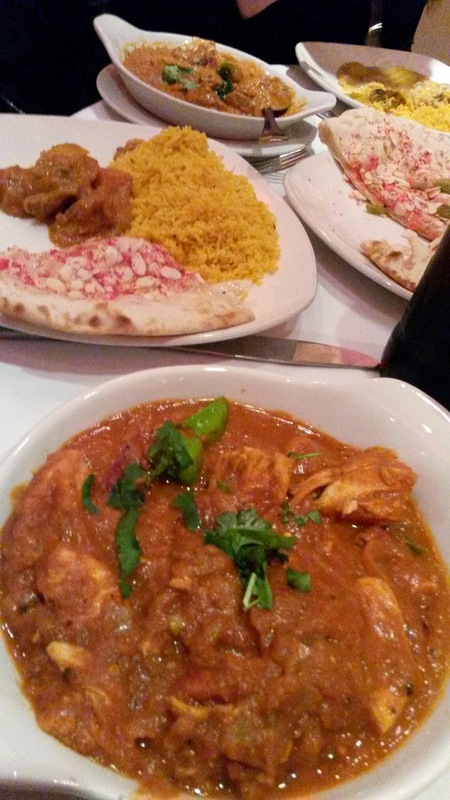 The korma was beautifully creamy and comes highly recommended. Whenever I've had Saag curries before I've felt they've been a little too dry but my brother was very happy with his and would happily eat again.